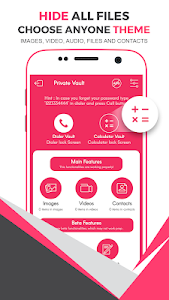 Here is an app that you can use to hide your private Photos, Videos, Files and Contacts without anyone knowing that you are using any kind of vault app. 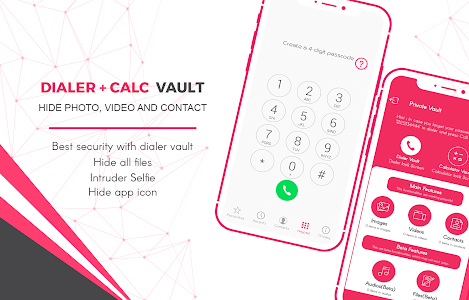 "Dialer + Calc Vault - Hide Photo, Video & Contact" hides pictures from any unauthorized person and secures them in the app that will be called Dialer. You no longer have to dread letting anyone go through your photo gallery on your Android smart phone or tablet as you can easily use this photo locker to lock all these private images, videos, audios or any type of file that you want. 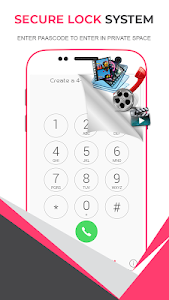 These encrypted images or videos can only be viewed and accessed via this app using the passcode and no one can open it without the passcode that you will set once you install this dialer locker. 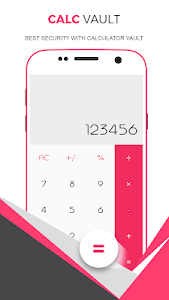 Also contains Calculator Vault Theme with in the app for who wants to use both vaults at one place. 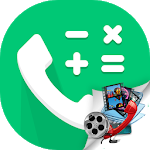 Easy to switch from dialer vault to calculator (Simply press dialer vault / calculator vault button to apply theme). 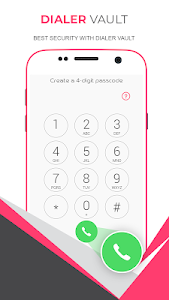 - Set a passcode in the very first time and remember it to access easily to your encrypted files anytime and anywhere you want from your android smartphone or tablet. - You can also create one fake space and manage files in there which can be access with different fake passcode. - We integrated the latest encryption technologies to help you to keep videos and photos safe. Once you add images to our app, no one will be able to see them because they are protected with file Vault. The only one who can see them is you because you have the passcode of Galary Lock. - You can enable uninstall protection to avoid accidentally uninstallation of photo video locker app. - Do you want to close the app automatically without taking a few second to exit it? Place your phone face down and our app will automatically close and lock itself. - You can hide main application icon from the app drawer to rais the security level of your private photos, videos, and files. 1) This app uses the Device Administrator permission "android.permission.BIND_DEVICE_ADMIN" : This application requires this permission to prevent uninstall this app accidentally. 2) This app uses Read/Write Storage permission "android.permission.WRITE_EXTERNAL_STORAGE" & "android.permission.READ_EXTERNAL_STORAGE" : This app requires this permission to provide you some functionalities like hide/unhide files, delete files, share files as per your action taken. 3) This app uses Read/Write Contacts permission "android.permission.READ_CONTACTS" & "android.permission.WRITE_CONTACTS" : This app requires this permission to give you dialer theme view, read contacts and add/delete contacts as per your action taken. 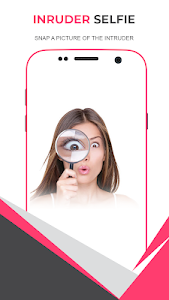 4) This app uses Camera permission "android.permission.CAMERA" : This app requires this permission to provide you intruder selfie functionality and take photos of intruders. 5) This app uses Fingerprint permission "android.permission.USE_FINGERPRINT" : In some fingerprint supported devices this app requires this permission to unlock vault with users fingerprint. * We are not using above mentioned permissions for any other purposes. We are not collecting or transferring your personal or device data out of your device via internet or to the any third party. Method 1 : Deactivate uninstall protection from Dialer + Calc Vault settings and then uninstall this app. Method 2 : Deactivate Device Administrator for this app from system settings and then uninstall this app. Your ratings and comments are appreciating us. So please encourage us with your suggestions to improvements of this app.